You'll be £16.99 closer to your next £10.00 credit when you purchase Victory and Pursuit. What's this? 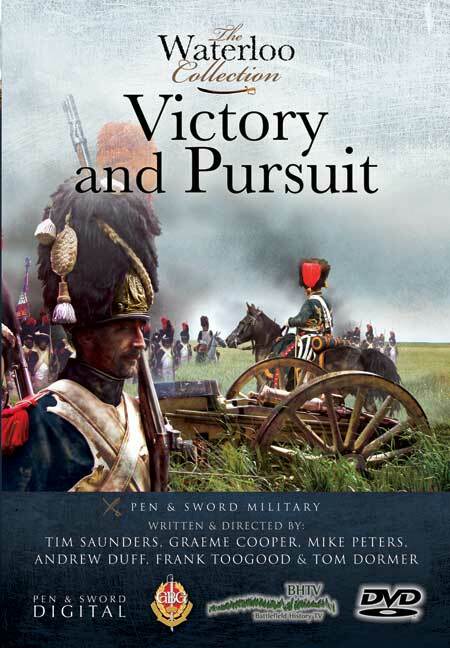 Victory and Pursuit is the concluding part in the explosive four part series, The Waterloo Collection, which covers the entire Waterloo Campaign from Napoleon's return to France and ensuing battles to his final pursuit and eventual surrender to the British. In this final part the great battle reaches its climax point as Napoleon attempts to exploit a brief window of opportunity to bludgeon his way through the centre of Wellington's defensive position on the Mont St Jean Ridge. The Prussian attack on Plancenoit had faltered and the Anglo-Dutch line was wavering; it was time for the Imperial Guard to march across the valley and climb the ridge to deliver the traditional Napoleonic coup de grâce. At the top they faced the British Guards and the Peninsular veterans of the 52nd Light Infantry to set in motion a plethora of climactic events. A dozen miles to the east, Marshall Grouchy, with no less than a third of Napoleon's army, was closing in on the Prussian rearguard at Wavre, having ignored a series of contradictory, confusing and impossible orders to march to the Waterloo Battlefield to the aid of his master. The following day he forced the River Dyle and drove the Prussians back across some tight and difficult country before receiving word that Napoleon had been defeated at Waterloo. From the field of the final French victory at Wavre, Grouchy executed a skilful withdrawal back towards the French border. Meanwhile, the Anglo-Dutch army counted the bloody cost of the previous days fighting while Wellington wrote his controversial Waterloo Dispatch and the vengeful Prussians pursued the French towards Paris, leading to Napoleon's abdication and the occupation of the city by the Allies. We all enjoy a good film, and there is nothing like watching history comes to life in the comfort of your own home. This DVD is the final part of Pen and Sword’s Waterloo series, and seamlessly follows the previous coverage of the French and Prussian attacks. During the ninety minutes there is plenty of time to savour the skill of the filmmakers, while enjoying the popcorn. The Waterloo series covers the battle in a total of four DVDs, dealing with the entire campaign with entire campaign from Napoleons return to the final surrender. As an alternative to the book format, this is an excellent way of presenting history. In short, even if the audience is familiar with the outcome, Part IV of the Waterloo Collection is 90 minutes that will hold the attention right to the end. ..overall this is an excellent 90-minutes worth of viewing, with a goodly supply of colourful artwork, neat maps and lots of re-enactors milling about. Well worth a look. ...not only well scripted but well produced. A high quality product, within a high quality series.